Wario Dunes is a sand court in Mario Tennis Open for the 3DS. It is set in a desert where cacti and an Egyptian pyramid can be seen in the background. There is another pyramid at the front of the court, similar to the one that appears in Wario Land 4. It has ruined sand bricks surrounding the court and it is heavily based on Super Mario desert levels. Unlit torches with their design taken from Super Mario Galaxy also appear. Red, Green, Blue and Pink Shy Guys surround the court. Wario Dunes is used for the Flower Cup tournament. 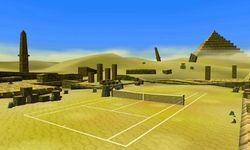 Wario Dunes is very similar to the Wario Court from Mario Tennis. Both are set in the desert and both are notable for having very low ball speed and bounce and feature a remix of the city stage theme from Wario Land 3 as background music. "A desert court surrounded by ancient ruins." This page was last edited on July 2, 2018, at 02:21.